I’m writing this from the future: from the year of our Lord 2017. I’m not much older than this century, so by the time I write this, your body will be long sown in the earth and watered with tears. I have not been alive in your lifetime. But you are a writer, ma’am, and in late 1936 or early 1937, you were writing an audio drama that has long since gone off the air. You know it’s hard to write sometimes. It’s hard to write a sweeping story that covers 178 episodes and spans three continents. Even as a professional, it’s hard to find time and harder still to find inspiration. It’s difficult to come up with logical characters, linear plots, good villains. Sometimes it may seem too hard. I’m here to tell you that it’s worth it. I know your story is worth it because, eighty years later, your story is worth it to me. One of the defining moments of my childhood was listening to your audio drama. I remember lying in the dark at ten, eleven, maybe twelve o’ clock at night – long after I was supposed to go to sleep, with the rest of the household asleep and the house silent and dark. If anyone else had been awake, they probably would have been able to hear the voices coming from my headphones, for I’m sure I had it at an unreasonable volume. I traveled to New York, to China, to Africa there. I recall one scene with the characters alone in the jungles of Africa. There was fire on the beach and crocodiles in the water, and their plane line had been cut; their only way out drifted across the water away from them. Heedless of the danger and of his companion’s fear, one of your characters jumped in and swam after it through the black-as-pitch waters. Bullets ricocheted through the water around him, with crocodiles barely stopped by those bullets. I listened to those tense few moments with a thrill going through my whole body and realizing, ah, yes, this is what heroes look like. Back in 1936, did you think that there would be a little girl, rigid as a board with excitement and thrill, listening to your stories in 2007? I can’t imagine that you did. I’m listening to your stories again this year. In fact, I’m basing a major project off of them. As I listen, as I’m older, I can see some of the flaws I missed back then. The characters aren’t always consistent. The plot doesn’t always follow a logical course of events. The dialogue is sometimes stilted. 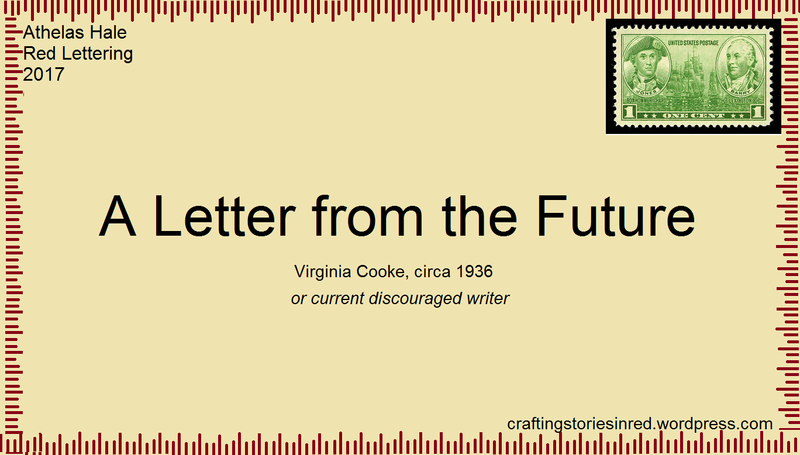 Your stories are far from perfect, Virginia Cooke, and the format is such that few people would listen to them and enjoy them today. There is no music, minimal sound effects, and the acting sometimes leaves things to be desired. If it weren’t for your stories, I wouldn’t think of heroes the way I do now. I wouldn’t think of police and criminals the way I do now. I wouldn’t write the way I do now, nor view stories the way I do now. I certainly wouldn’t use some of the phrases I do now. You, with your imperfect story written half a century before I was born, have changed me. I guess you know by this point that I’m not really writing this to you alone. Even if you did struggle with writer’s block back in the 1930s, I wouldn’t know, nor could I send this back to encourage you. So I say these same things to my writers of today. In eighty years, do you know where your story will be? Will it be changing the life of another little girl, crouched on her bed at 11:43 with a flashlight illuminating the words of your story, and the words of your story illuminating the world’s darkness? It’s hard to write a sweeping story. Logical characters. Linear plot. Well-done villain. You know that and I know that. You know what else you know? It doesn’t have to be perfect, love. You know this, too. It just has to be written, and you never know how far your story will go. Maybe eighty years later, it will still be changing lives. I, Athelas Hale, write this in July, the year of our Lord 2017. Thank you, Virginia Cooke, for your stories. Occasionally, there comes a time where women must become warriors. Those times are few and far between (and usually come up because your author is borderline feminist), but without a doubt, they do occur. As you sit in your armor (which has been properly constructed to guard your internal organs, not to look cool—right? 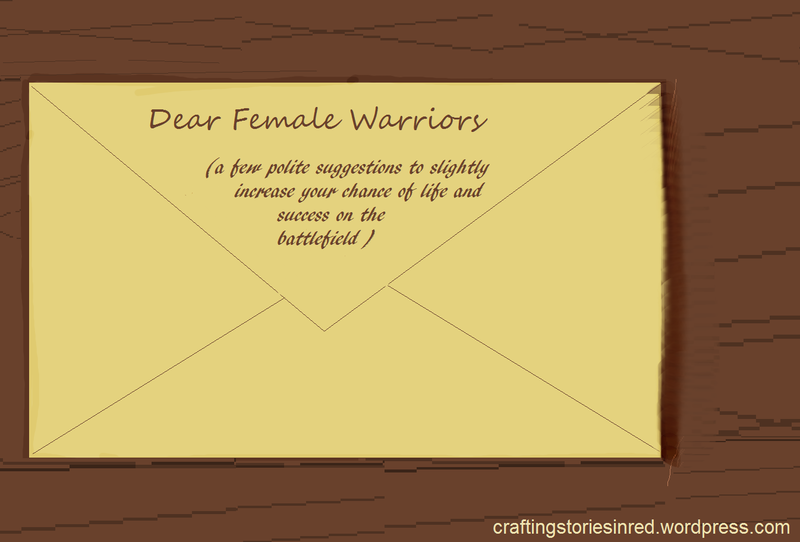 ), in the midst of your war camp reading this letter, you have apparently come upon such a time: you, a woman, must become a warrior. Possibly no one else stepped up and became a warrior at this time; perhaps you are the Chosen One who is destined to save the world; perhaps you are in a unique political situation which forces you to be the one to take the reins and lead your country to victory. Perhaps you live in a world where female soldiers are the norm (in which case, you’re likely not in the midst of your war camp wearing medieval-style armor), or you’ve been drafted into the military; perhaps you’re simply a young lady who ran away from home and joined the army. Whatever your reasons, you’re the heroine, so you’ve probably made the right choice for your situation. If you haven’t made the right choice, you’ll surely figure it out later. I won’t ask for your reasons; the point of this letter is to slightly increase your chance of survival until you either have won the war, or regretted your choice and returned home to be reunited with your estranged parents. First off—your clothing choices. We covered most of the problems in another post a few years ago, so this will be brief. Remember that you are a female: you’re most likely smaller and weaker than most men. Consider carefully what kind of armor you’ll wear, and remember that on the battlefield, sometimes lighter is more practical for you. Remember (and remind your authors) that research is vital when picking what armor you will wear. What you know about the weight or flexibility of medieval armor may be incorrect. If you do decide to wear armor, remember: your armor is meant to protect your vital organs, not make you look nice. I promise, no one is going to be admiring you in battle; to quote Father Christmas, “battles are ugly affairs”. Everyone is fighting for their lives, attacking, counterattacking, being thrown from place to place and focused only on the person they happen to be fighting right at that moment. People just don’t have time to be admiring your fancy armor. What the do have time for is noticing that you’re not wearing vital protection over your important internal organs. If you have the funding, by all means, get your armor custom-made so that it fits you better; but get it made well. Your long hair is an accident waiting to happen. You are not an indestructible Warrior Elven Princess*, and your hair will not fly out majestically behind you. Instead, it will get tangled; it will get caught; it will be grabbed by your opponent. As a woman soldier, you need to consider this, even when you aren’t on the battlefield. If you are the one leading the battle, expect assassins; if you have no political power—did I mention you’re the heroine?—expect assassins anyway. Either keep your hair tightly put up, or cut it off. Skirts are most likely not the best choice for battle gear. That said, as a female soldier in what is most likely a Young Adult novel, you might be under the misconception that skirts get in the way, or that you can’t move in them. Madame, you are wrong. For ages, people—men, even— have worn robes, skirts, or kilts, even into battle. In formal clothing, you may have trouble with overly large or overly tight skirts, but simple skirts are unlikely to restrict your mobility too much as you go about day-to-day life. If you’ve decided to become a warrior, you’ve surely trained. You’ve spent hours learning to fight, strengthening yourself, forcing your body to become a weapon. Now, you’re probably ready to fight. But you’re still female. Where I come from, typical males are not only taller than typical females; they also naturally stronger and weigh more. This may be different depending on your race and location, but it will be the case for most humanoids. You may have trained hard. You may be strong. You may have even trained hard enough to be the best fighter anyone has seen this side of Pluto. But the moment you meet a male foe who has the same amount of training and dedication as you, you have met someone who is not your equal—you’ve met a fighter greater than you. Always look for unconventional ways of fighting that will turn the fight to your advantage; don’t allow yourself to get locked into a combat that depends on your size and strength. If you’re a high-profile political lady who is leading your armies into battle, consider investing in a bodyguard to help you with the aforementioned assassins. There is no shame in recognizing your limits and finding ways to compensate for them (so you can stop giving me your typical warrior-female glare and snappish, “Thank you, I think I can manage”). Another undeniable limit that you’ll need to be aware of is your emotional state. Whether or not females feel emotions more strongly than males is a question that can be disagreed on and debated for ages; what is not in question is that females feel emotions differently than males. And in many females, that makes it very difficult to fight in a war (not to say that men are wired to go around violently ending each other, either; no human (and therefore, I assume no other sentient creatures, since I have seen no data suggesting otherwise) was intended to fight in a war, and it deeply effects and changes any person who must do it). Female warrior, you are about to go through the most grueling, emotionally and physically challenging thing you have ever gone through. You will be tested on every level. You will break and break again in the dead of the night when the trauma of what you’re going through is going to come back to you, keeping you awake though every exhausted bone in your body begs for rest. You will see comrades and friends slain before you; you will slay your opponents. Your body will be unbalanced, allowing your emotions to run through you more fiercely. You will forget what it means to be okay. You’re going to need to learn to balance your emotions, especially if you are one of the leaders of the army. You need to think rationally. You’ll need to learn how to recognize when your emotions are beginning to get out of control, and learn how to rein them back in. Learn to put off the emotional breakdown until after the immediate crisis is over. Recognize that your emotions are far out of control, insist on your author telling this unwanted part of your story, and then do your best to get them under control. When it comes down to it, you either must learn to recognize and control your emotions, or you will break. Warriors, have you ever wondered why so many people seem to have romantic subplots in the midst of their end-of-the-world scenarios? It’s because emotions run high in times of deep stress, and people forget to be concerned about how awkward it is. Therefore, I stress to you here my last and most important point: Say no to mixed-gender divisions. On top of everything else, the very last thing that you need is a romantic subplot. Your emotions are out of control; so are the emotions of everyone else in your division. If you managed to be placed in a division with honorable men and an honorable system set up, that helps—but only with about half of the problem. Men and women like each other. They really like to impress each other. With a war going on and everything going wrong, you dearly need your people to not be attempting to impress one another with feats of bravery. You dearly need your people to not be competing for anyone’s affections. Because emotions are at peak strength, if you place men and women together under harsh circumstances, fighting side-by-side, living in close proximity to one another when they’re not on the field, couples will form; competitions will follow. Your units will cease to work together. Aside from the potential disastrous romances that form in a mixed-gender unit, there are other problems. Notably, the difference in the physical capabilities of men and women will endanger the unit; part of training is to teach your groups to work together, at the same pace. Having both men and women in your group will cause men to be faster at some tasks, and women faster at others, putting the whole group in danger. Another issue is that honorable men do not allow women to die. Several days ago, while conversing with a friend of mine, the subject of men and women fighting together came up. My friend said that part of the reason that’s a bad idea is because honorable men do not allow women to die; he stated that, if two men are fighting together, one can allow the other to die if they both see it’s the best thing for the cause for which they fight. However, an honorable man can’t allow a woman comrade to die. If you set up a group with men and women fighting side by side, when it comes down to actual combat, the men will be more focused on the women around them: their focus will be on keeping the women safe rather than advancing the cause for which you fight. Distracted soldiers are dead soldiers. Warrior female, if you must go to war, do everything in your power to be assigned to a female-only division. If you are in leadership position, set up your military so that men and women are separated into different divisions; not only will you bypass the problem of incidents from dishonorable men in your military (because there are always dishonorable men in every military), you’ll most likely increase the success rate of your army. If you are only a common soldier with no rank, insist that your commanders look at this situation. However, in spite of the fact that your commanders probably want to win the war, they’ll almost certainly ignore your request, because they’re military commanders (in their defense, completely rearranging an entire army is quite a hassle right as you’re going into a war). Though a good deal of these suggestions won’t apply to those of you who have made the decision to go into battle disguised as a man, I hope that this letter will be of some assistance to the rest of you. Be safe. Win your war. Make it home to your estranged parents. *If you are an indestructible Warrior Elven Princess, why did you just spend time to read this article when you can ignore all the advice herein, and not only succeed in all of your battles, but look fabulous whilst doing so? Every year—sometimes twice or thrice a year—my family experiences an upheaval to our schedule as a few of the writers in the house participate in a National Novel Writing Month Event—whether the National Novel Writing Event in November, or the two Camp NaNoWriMo events in April and July. A good portion of you writers know what they are, how they work, and what I think of them. For those of you who don’t, you can click the websites for the first two, and look at my other NaNoWriMo posts for the second. NaNoWriMo events are some of the most exciting and helpful things for writers, aside from writer’s conferences and publishing deals, and NaNoers join up from all corners of this world to write (occasionally a writer will participate from Narnia or Arwiar, but internet signal is bad there, so it’s pretty infrequent). Some writers come away with 50,000 words of nonsensical words, and others come away with a workable first draft (one friend of mine also uses NaNo events to edit, but I’m fairly certain that she has superpowers, so I wouldn’t recommend attempting this for the rest of us). Sometimes we succeed, and sometimes we don’t; either way, it tends to be okay. Either we gain twenty thousand words of story, or we learn something. For most of the five years leading up to this post, I’ve come away from a NaNoWriMo event with decent words. Never perfect words, but decent ones for my stage in writing and in drafting. In November of 2015, I came away with a fifty thousand useless words, mostly beginnings which I quickly marked as useless. Among those words (which I assure you has found a dusty, shadowy corner of my hard drive to hide in), I learned something. From my experiences during NaNoWriMo last year, I learned that there are certain things that you absolutely must be clear on before you begin any sort of intensive writing. 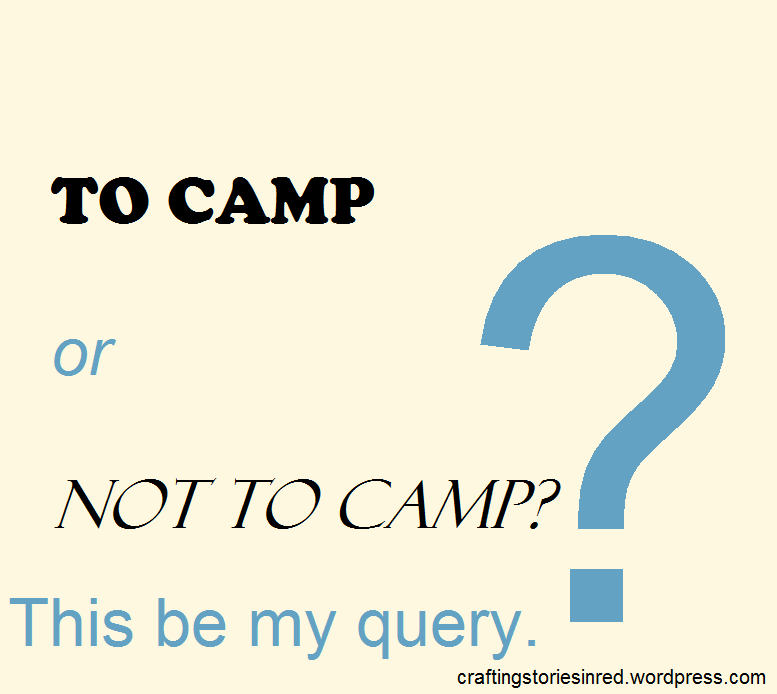 The Camp NaNoWriMo website just went live for July, but before you begin writing your grand novel, there are certain things you need to work out. Your characters. You don’t necessarily have to know everything about your characters before you begin— even hard planners don’t do that. Characters change and develop more deeply as the story progresses; you’ll never know a character fully until they’ve come to the end of their story (unless, that is, they’re a two-dimensional Mary Sue, which is to be avoided at all costs). Whatever method you use to develop your characters should be done before the month starts to avoid needless frustration on your part. You can either develop your characters before going in to draft one, or you can develop them in post. Doing it in the beginning is always easier. One piece of vital information about your character is their character motivation. What is their want that drives them to do what they do? What thing do they need? The two things are rarely the same thing, but occasionally they’re directly in conflict. A character’s want/need drives all aspects of their action. You can know what their favorite type of ice cream is, but it will never help you as much as the simple knowledge of what their goal is. Your setting. Your setting will influence all of your novel—your plot, your character, the way other people interact with your characters. Your setting includes everything from your political and cultural climate to your actual physical setting. Politics always play a part in world-changing events; be aware of what is going on in the background. Before you start writing, know what sort of region your story is set in, to avoid accidentally switching around mid-way. Consider which setting is best for your story before you begin telling. It can always fixed in editing, but again, it’s easier to set out with the knowledge than to have to change things after you’ve finished. Avoid having to edit out guns because you decided partially through the story that your tale would better be served without pistols. Your concept. Clarify your concept. Know what your story is about—if you write strongly from themes, consider what your themes may be (though most people who include themes in their story find out half-way through, it still may do you some good to think about it before you start). Think about the direction that you want your story to go in, even if you don’t plot it out entirely. Having a general idea of where you’re headed helps to keep you on track. Your concept can include your original idea, what sort of story you want to tell (a war story, a coming of age story, a space story? ), any major plot points or plot twists; it can be however in-depth you want it to be. Just be aware of what sort of story you want to tell before you start trying to tell it. How in-depth you go depends on your personal preference. If you feel like you need to plot all the way to “The End”, by all means, do so! If you’re more comfortable with little planning, there’s no need to plan it all the way out. But always, always remember. You can’t SotP it all the way through. Are any of you planning to do Camp this July? What is your plan for the month? Planning or SotPing? *For those who are unfamiliar with this particular writer term, SotP stands for the phrase “Seat of the Pants”, meaning that a writer goes into their writing with little to no planning or idea of where the story is going. As a child, I read frequently, various books and of various genres (as a slightly older child, I still read various books, but my genres tend less toward slightly realistic fiction for seven-year-olds). Of some of the oldest memories I have regarding reading, I recall there was one series I read multiple books in—I can’t remember the name, but it was one of the aforementioned slightly realistic books for seven-year-olds—that chronicled the life of a young girl from childhood to motherhood. That is, the series chronicled her life from childhood to motherhood; I was done at the first sign of any romance. My years of bailing out at the first romantic glance now long since over, I’ve found that many authors, whatever genre they write, have a desire to include romance. Occasionally the romance is fabulously well done; frequently I tolerate it; every now and then I’ll make snarky comments about it for weeks later. Throughout the ones that I like, there are a few solid aspects that always make their way into it – sweet romances are the best, with respect for one another and an intact brain even while they fall in love (what a novel idea!). As with most things, there is no easy-to-follow formula for the perfect romance, whether in your story or in your story. However, for your enjoyment and for the education of your characters (and hopefully the improvement of your romance subplots), I’ve compiled a list of seven poor decisions I see most often in the romances that dance (by moonlight, most likely) across the pages. For years, The Spontaneous Kiss, our starring guest, has been considered a good option for any young, dashing hero. In any situation where he loves a young, charming lady, but has yet to tell her that he loves her, the spontaneous kiss is clearly the option. It’s romantic, and very straightforward. The girl will clearly not only understand everything better now, she’ll also appreciate it and cherish the memory for years to come. There have been a few instances in real life of this working, some love stories that I’ve heard which began with a spontaneous kiss and turned into something good and beautiful, but those are the exceptions that make the rule. The rules, in this case, are don’t touch someone where they don’t want to be touched. Don’t surprise someone by taking them to their own, unplanned wedding. Don’t kiss someone suddenly and take away their ability to say no. “No,” she says. But clearly she means… “Yes.” Not to be dissuaded by her apparent lack of interest, our young hero stalks her, creates opportunities to “accidentally” run into her, follows her through whatever dark forest she happens to be questing through, because eventually, she’ll change her mind and realize how much she should love him. Congratulations, my good man. You’ve become the perfect embodiment of Stalker Love. This one goes back to basic respect and, quite frankly, you can get arrested for that for good reason. It’s a disturbing tendency and, if you can’t respect her to say no, how do you expect to love her for the rest of your life? If she can’t trust you to respect her, how do you expect her to love you for the rest of her life? By all means, go talk to her, but talking to someone in a polite and respectful manner is a far cry from stalking her. The charming, beautiful young lady tends more toward this particular decision—and, thankfully, I have yet to see this one in too many of the books that I read, but it’s still there, lurking, a long-dreaded beast from the shadowy land of 1940s soap operas. In this case, someone attempts to re-attract their lover by way of jealousy, flirting with another man to get their man to want them more. The trouble here is, any lass with a fully functioning brain (and I dearly hope that your charming, beautiful main character has one of those) will see in a heartbeat that this is only bound to cause trouble. People will get hurt; emotionally and physically. The situation will quickly grow sticky, and you’ll find yourselves trapped in the endless drama of a bad 1940s show. You’ve been warned, O charming main character. Ever since Beauty and the Beast, people have been falling in love with the idea of Stockholm Love. As with the last one, this mainly affects the pretty lasses who are kidnapped by the male (who is usually remarkably handsome, as if only the remarkably handsome males turn to a life of—mostly nobly-inspired—crime). Obviously, she’s a little rattled by this, but after she regains her cool, she slowly starts to realize… she’s falling in love with him. This can be brought about by various different things; he’s either very noble and kind for a creepy kidnapping psycho, he’s ruggedly handsome, or he’s tragic and broken, and she wants to do something about that. I admit that this particular poor decision would most likely be me. I have a tendency to see brokenness and try to fix it, so, O sweet and pretty lasses, listen to me when I tell you: it’s not a good idea. Yes, your author will probably see this through and he’ll turn good and you’ll live happily ever after, but only because that’s your author’s tragic hero character. If you are in a situation where a man is holding you captive, your first thought should be to not get killed, and then to getting yourself and any other hostages out of that situation. Your emotions are not reliable in periods of high stress and there are far, far better times to be falling in love. Always avoid Stockholm Love. Set in a medieval land far, far away, there are two kingdoms or two houses, both high in power. A young lady and young man are of the same age, and to secure an alliance (or maybe, just occasionally, because they’re both young and unmarried and need a spouse), their parents arrange a marriage between them. It’s friendly, it’s uncomplicated, they know who they’re going to get married to, and there should be no problems in a culture where this is clearly the norm. Except! There’s another two people, also (surprisingly) of the same age; also unmarried, and most likely remarkably good-looking (are we starting to see a trend here?). 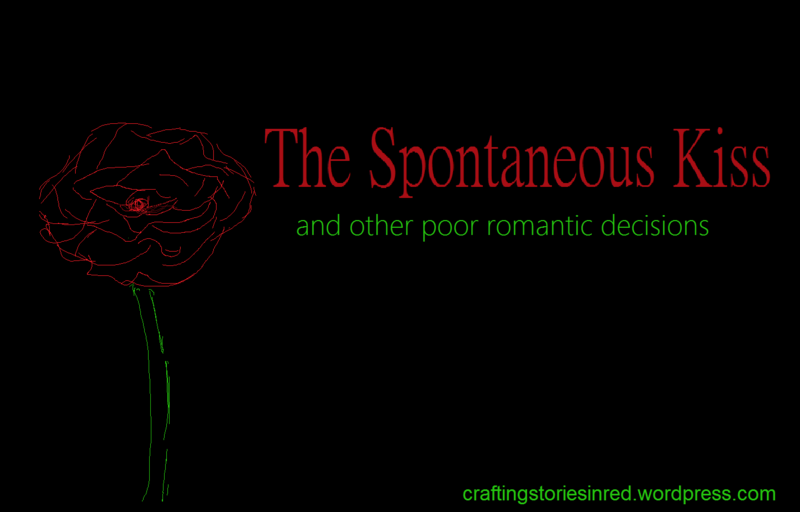 In spite of the fact that both the young lady and the young man are aware that they’ve been promised in marriage to another, they both seek to spend time with the other person, noting as they begin to develop feelings for them, and decide to pursue a romantic relationship with a person other than their betrothed. Please don’t do this. If you are promised to another, it is your duty to guard your heart and your mind from straying, just as if you were already married. If you have reason to want to avoid marrying your betrothed, by all means, work it out – but don’t fall in love with someone else when your hand belongs to another! This will cause endless issues after your marriage. Note that this scenario usually works out in stories, but only because the writer has made it their goal to speak out against the oppressive practice of arranged marriages, which was not only not oppressive, but also went out of style in the west long before any of them were born. After a relationship has already been established between two characters, whether they’re engaged or simply officially “together”, there comes up the topic of kissing. Specifically, for a good many characters, frequent and passionate kissing while in dangerous situations. Kissing is going to completely destroy any situational awareness. Off the top of my head, I can imagine a hundred better places for kissing than the side room the characters ducked in to as they infiltrate the villain’s lair. Save the kissing for romantic moments and avoid getting a spear thrust through your characters while they’re distracted. One particular trend that always seems to pop up in romances, especially of the Young Adult variety, is Instant Love. You were expecting me to quickly bash this one’s head in and send it home robbed of any power it had over these stories, weren’t you? Well, I’m afraid that’s not my plan of action for this particular one. Instead, I’d rather tell you a story. Two decades and a few years ago, there was a young man, and a young woman. He had just gotten out of the military, and as he found himself in the mall where the young lady worked a cart, he still wore the paint-flecked pants in which he had painted his army barracks. From across the mall he saw her, and thought she was much too pretty for him to pass by without talking to her, so he made his way across the mall. Upon reaching the cart, his eyes fell on a tiny “Now Hiring” sign and – though he was not looking for another job – he asked for an application. The young lady told him that she was doing interviews that very day, and she interviewed him on the spot. She remembers him as being unbearably shy during that first interview; he didn’t even meet her eyes once, but at the end of the interview she told him that if he would come back the next day and show her that he could wear something other than green-stained sweatpants, he could have the job. She never thought he would return. But he left that cart, and from that very mall, he bought a new pair of clothes with which to return the next day. He got the job. And he married that girl. A few years and a couple of children later, I was born. My point of the story is this: there is a difference between “Instant Infatuation” and “Potential Love.” Potential love is to see someone or talk to someone and be very aware of the fact that you could, and would like to, fall in love with them. Instant infatuation is the “Instant Love” that so many YA novels use as a poor substitute for a well-written romantic subplot. If a person can take one look at someone and instantly be head-over-heels in love, there is a very simple explanation: it’s not love, and it won’t last. In the end, a love that lasts is really what we want for romances – whether in-story, or out. When I was a wee little lass, scarcely old enough to be allowed to remain awake during napping time, far from understanding the complexities of writing—though my timeline is likely a little mixed up (few young children categorize: On this date, at three o’ clock in the afternoon, I decided I want to be a writer), I doubt I had any interest in writing stories at that point. Ah, but I loved to read. This was a good thing, with all of the reading we young ones did for school in those days, and through studying certain old legends and myths, I found myself a hero. A brave man, strong, the very best of the king’s knights. I adored him, my hero, and through a few weeks of study, decided he must have been the best man in medieval history. His name was Lancelot du Lac. And before you ask: no, I didn’t know. On that day, my first hero fell. He did the thing with Guinevere that even I, a small lass though I was, knew was wrong. I desperately hoped that he’d turn back, that he’d make things right, but the hero that I had loved never did. Furthermore, Lancelot and Guinevere caused everything to fall to pieces. Wow. Well done, you two. There is so much stress these days on giving your heroes (or heroines) flaws. It doesn’t matter who they are, where they come from, or what they do — as long as they make horrible decisions, mistakes, or are wretched people. While I’m all for having characters that are people (and therefore are fallible, have doubts sometimes, make mistakes, and may have flaws), there’s such an emphasis on making sure they aren’t perfect, that people seem to have forgotten what heroes are. Heroes are the men and the women who step up and do what’s right, no matter how hard it is. They’re the folks who never give up the fight. Sure, they consider quitting. But eventually, they keep fighting for what is right and good, because that’s what hero does. What you look for in a hero, which many people try and fake with flaws, is personality. Instead of throwing in random flaws or terrible habits, take the time to develop your characters into the type of person who is a hero. People look to fiction to find heroes (whether we ought to or not). Make your character the type who inspires your readers to do good. Though, what matters in the end is not whether or not they were a perfect person during the book. They may have made mistakes at times — huge mistakes. But in the end, if they understand, if they want to make it right, if they’ve learned, and if they’ve turned themselves around, they are heroes. Lancelot never got that. 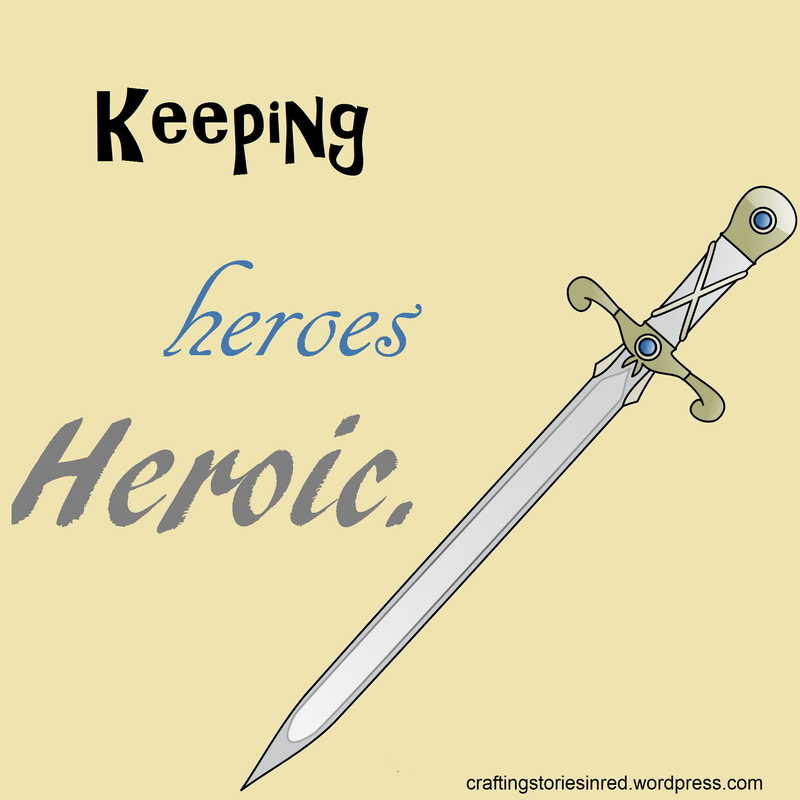 Perhaps, if Lancelot had turned himself around and did his best to make right what couldn’t really be made right, he would still be my favorite character, or at least the Arthurian Legends would still be my favorite of all the legends. But this once good hero crashed, failed, and did not find redemption. And I never remember loving any other character as much as I loved him. I never cried over a book as much as I cried over him. I never again trusted a hero as much as I trusted him. You may be laughing to yourself. Boy, does that sound overly dramatic. But it is true. As an afterthought: I may still be just a tad prickly about Lancelot. Beware what you comment. *You may think you’re too old for The Pirates Who Don’t Do Anything. You aren’t. It’s one of my favorite movies — and I am very picky about my movies. 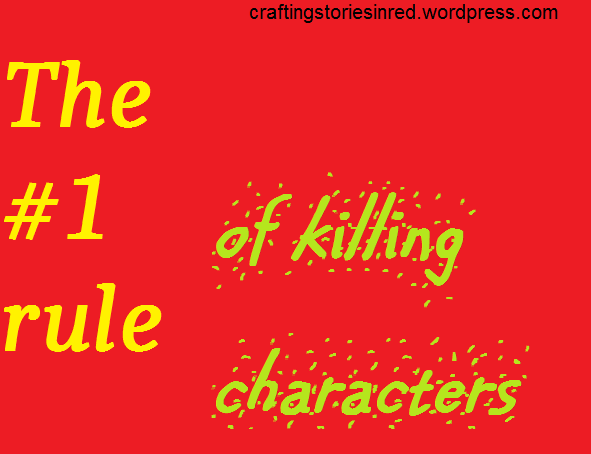 What is the #1 rule of killing characters? Aha! You know this one, don’t you? “Always have a reason for death.” Good rule, but not the rule. “Never kill off your main character.” Heh…heh…heh. “Just kill your character and avoid the miraculous healing?” Ah, you are clever, aren’t you? But that’s still not the rule of killing characters. “The rule is, always have a– *static*” Shh. I’m not ready to reveal what the rule is yet. You should always have a reason for death. Your plot should always, without fail, benefit from the death of one of your people. Your characters should go on a lovely development arc following the traumatic experience of losing their father, best friend, or love interest (it cannot possibly be the mother, since they’re always dead at the beginning of the story). You should always have a realistic way for them to die (avoiding shooting your henchmen in the arm and expecting them to die (Roy Rogers, I’m looking at you). There should usually be foreshadowing leading up to the death of a character, but not always. What, then, could possibly be the rule for killing characters? In truth, it depends on whether or not you want the character to stay dead. Assuming you want the character to stay dead, let me show you how to use the most important rule in killing your characters. And that, good readers, is all. The #1 Rule of Killing Characters is to have a body. Have a funeral. A memorial service will not do at all; you need to actually have the body mentioned. A couple of years ago, in the Tales of Goldstone Wood series, a character died off-screen. Immediately, I jumped at that. The character, obviously, was still alive. Longer ago than that, while the death of a character in Adventures in Odyssey was mentioned, his body never was. Bingo. He was, obviously, still alive. And, if you have any knowledge of Marvel (while I’ve never watched anything Marvel, I’ve learned quite a bit from Pinterest), you’ll know that a body is absolutely necessary. There are so many other characters I could mention who I knew would be coming back because of their lack of a body. Sometimes I was right, at other times, I was wrong; each time, I waited for the character to stride once again through the door. While your reputation will determine if a reader automatically assumes the character is still alive, I know I – and several others – will immediately say, “Nope, he’s alive,” if you don’t present the body to us. The readers assumptions technically change nothing of how the story proceeds, but as any author knows, the reader is always right. Even when they’re wrong, their thoughts, their impressions, and their convictions about the story will never leave them. If you lack a body for your dead character, your reader will be on the edge of their seat, waiting for the fellow to pop up again. When he doesn’t, you’ll leave them disappointed. And we’re trying to not disappoint our readers, remember? Make them cry, yes. Make them laugh, yes. But never disappoint them. Note: I must admit, I’ve been rather lazy about posting on this blog recently. I’m sorry to have disappointed you by being thus, and I shall endeavor to do better. 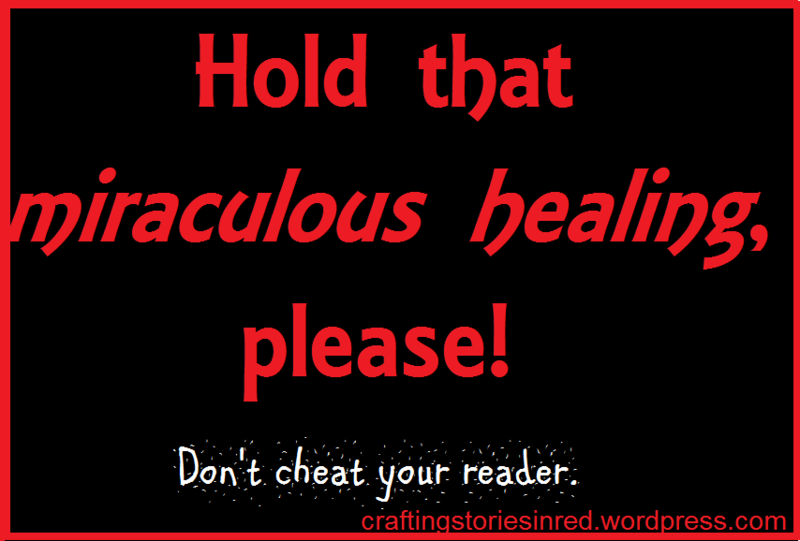 Hold that Miraculous Healing, Please! “Please, Neil!” I sobbed, pushing the bandage harder against the wound. Regardless of the pressure, the bleeding didn’t stop. His body convulsed with his uneven breaths. His face glimmered with sweat. Blood mingled with my tears as they fell upon the cobblestones. “Please, don’t… don’t die,” I forced out through tremulous lips. The wound didn’t listen, the dying didn’t stop, and I knew – this was the end. Then, all of a sudden! No worries, someone random steps out from behind a bush and magically heals Neil. Everything’s fixed, Neil can still save the day, and all you readers who were worried about poor Neil — you don’t feel cheated at all, do you? Putting conflict in our stories requires things to be hard for our characters. Sometimes, we take that to an extreme level before realizing that, since we’ve done our research on injuries, we can’t get away with having the characters heal rapidly. The easiest solution springs into our minds: we can just miraculously heal the characters! Problem solved! After the characters have been magically healed with no troublesome after-affects, they go quickly back to living their life. Everything is fine. Your readers were expecting a dramatic rescue (or a tragedy). They certainly wasn’t expecting a sudden and anti-climatic departure of the drama. Suddenly, with Neil okay and charging off to defeat the bad guys, your reader slowly backs up. Their grip on the book loosens as their eyes remain wide. While certainly it wasn’t your intent, you just cheated your reader. The emotions you brought up, the suspense you formed, the desperate, “No, Neil, don’t die!” running through their brain just disappeared in a whiff of smoke. The emotions were forced and – apparently – worthless. Even if your reader doesn’t care about dear, dear Neil, you would have shocked them from the story and left them feeling bewildered. Furthermore, even if your reader isn’t the bewildered type, you just sacrificed the drama of the long nights of your heroine sitting by Neil’s bedside as he hovers between life and death. You’ve lost the possible growth and character arc caused by the near-death experience. You no longer have the ability to have Neil continually suffer from the half-healed wound as he dramatically waves his sword around. Miraculous healings can be done well (though I can’t at the moment think of a time I’ve seen it). If the healing takes away the mortality of the wound, but leaves the pain, you would have an added layer of tension and emotion. If miraculous healing requires the death of another character, you’ve kept up the tension and have more potential in your story. Perhaps once, these sudden healings were original, but now, they reek of overuse. While your books is yours to decide about, always think twice about miraculous healings. Always ask yourself: is what you gain worth what you lose? 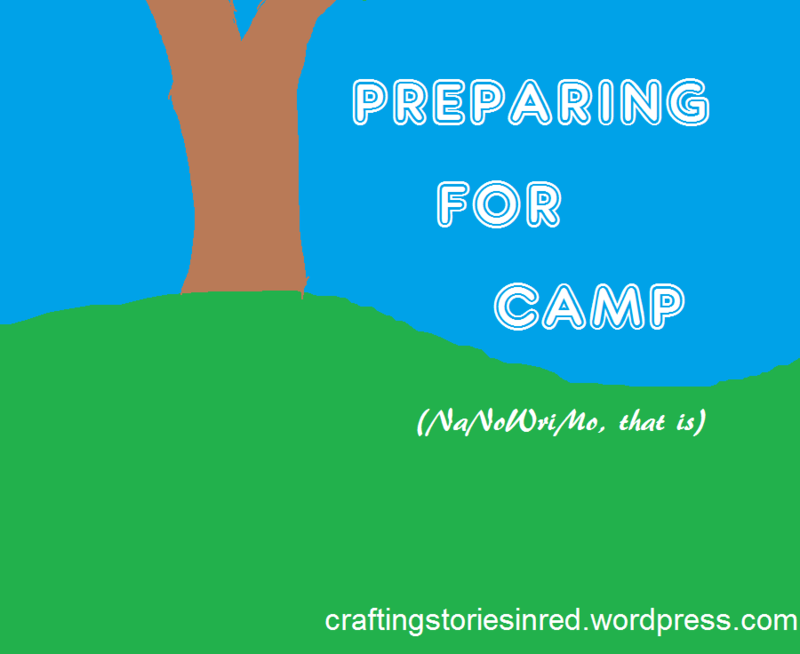 It wasn’t very long ago that I wrote about NaNoWriMo or Camp; most of you who are here now reading this post will remember both. A few of you are new here – and for ye who haven’t read the other posts, the next paragraph is for you. Ever since my first time doing NaNoWriMo , a challenge to write 50,000 words in the month of November, I have continued to come back. I’ve won all four times I’ve participated, and twice during the three times I’ve done Camp (in which you can set your own word goal). Ever since my first time doing NaNo, I’ve supported it wholeheartedly; in fact, I prefer to write my first drafts in a short period of time. A month full of stats, web badges and encouragement just makes it all the better. November is my favorite month of the year, with April and July coming in close behind. One of my (unofficial) goals for this year is to participate in every event (and edit in between… oh, joy). I have, for these four years told people that they should try it; that it is a very good writing tool for every writer. Now I am older and perhaps slightly wiser, and, while I still love NaNo and will still participate every chance I get, I now know that NaNo may not be best for some writers. Those of you who are full-fledged NaNo supporters are now staring at me blankly. “What…? But–!” You say. No, wait. Let me finish. I prefer to write my first drafts as fast as possible. In fact, I epic-ly failed a 100 words for 100 days challenge, for that is not the way I write – I write all at once, as fast and hard as I can, to reach a specific overall goal. Yet some writers need more time to write as they go. They write slowly so they can be sure the material is good. They work to smaller goals on the way to the bigger ones. We are all writers, but as different people, we have different styles. 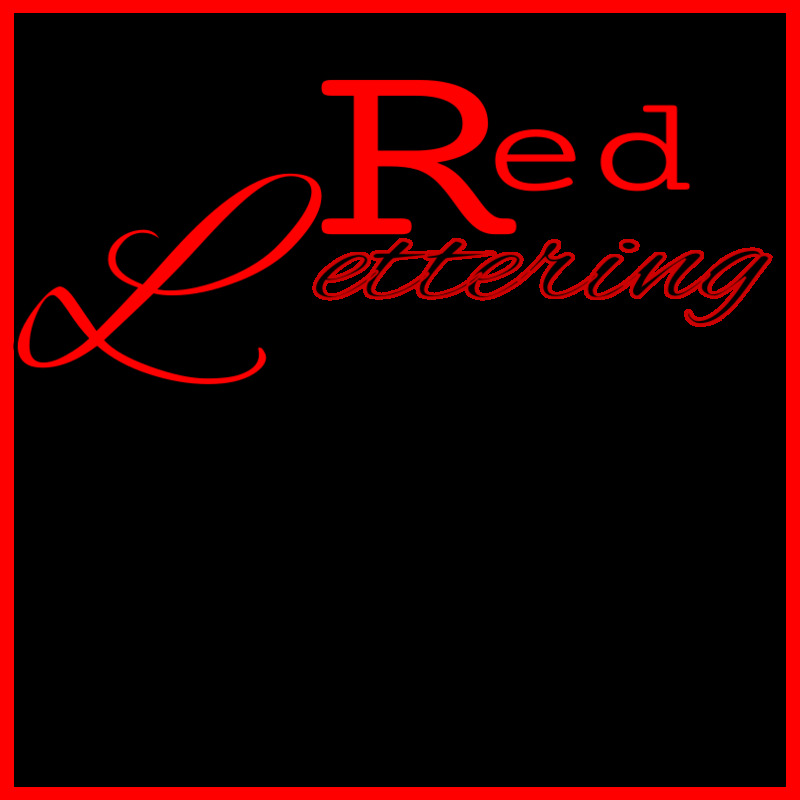 As we learn the way we write best, we will produce the most quality work we can. If NaNo makes you feel rushed, don’t do it. If editing as you go makes you lose your creativity, don’t do it. Try out different methods, even if your writing friends do it a different way, or you’ve heard it done in a particular manner. As soon as you learn how you write, you’ll enjoy it, you’ll be more productive, and you’ll be more likely to keep up with whatever goals you choose to set. Do try out NaNo, Camp, or other writing programs, but be ready to change your strategy if necessary. If you do participate in Camp, I would love to know what you’re working on and what your word goal is. So many times recently, I’ve seen so many posts in so many writing blogs, giving so much writing advice that offers a formula. This is how your beginning should go, they say — or, perhaps worse, Your novel should have a character type from all of these. And to this, while they’re all very talented writers, all I can say is, HA! Of course, I wouldn’t state it like that if I was speaking to an individual. To keep certain novels from suffering with low self esteem, the AfPoCR (they’ve branched out since they named themselves the Association for Protection of Character’s Rights, but chose to remain the AfPoCR) came up with a slogan: Every novel is loved – Every novel is special – Every novel is unique. And, indeed (though the AfPoCR tends to be a little extreme at times), the last part is very, very true. Imagine A Tale of Two Cities compared to Left Behind*. Both are novels, both fiction, both written by men —and yet, they are two drastically different stories. They both have drastically different characters, different beginnings, and different endings (something about the world ending in one). And yet, both of them are good novels, beloved by many readers. There are many such book out there. Though they’re incredibly different, both are good; neither is correct or incorrect. You do not need to have eighteen different types of characters in your novel. If you think you can’t properly manage that many characters—or if you don’t think it wouldn’t be best for your novel—you can dispense with the father, stepmother, guide, and multilingual best friend. You don’t necessarily need your hero to have an elderly guide. While monkey wrenches are sometimes fun to have around, they don’t always need to be there. And, while the three-act structure is common and clever, there are other forms of story structure which you can use. The odd thing about writing, the one thing that we all end up both loving and hating, is that there is no formula. There is no Seven Steps to the Perfect Novel; if there was, what would the use of reading novels anymore? They would all be the same story with slightly different characters and only vaguely different plots. You, as the writer, posses the imagination, the skill, and the power to create your own characters, your own novel, your own story structure. While you can do things similar to another author, you don’t have to follow all the steps. Do read them; do learn from them; do consider them. 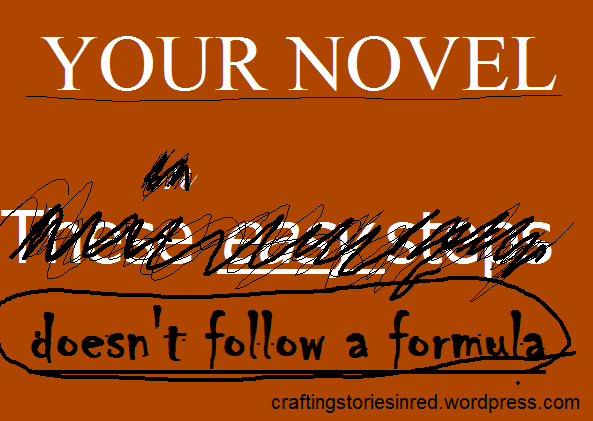 Yet always be aware that, whether your favorite author, a bestselling author, or a random name you don’t know states it, they don’t have the perfect formula for your novel. * I have actually not read Left Behind, but instead am basing my assumptions about it off of what my sister told me. Well, as some of you (clearly not those who asked) may know, Purim is the Jewish holiday celebrating the events that took place during the book of Esther. As for why I’m mentioning it here— you remember when we spoke about Creating a Fantasy Culture a few weeks ago? That was more of an overview. Today, since Purim is on my mind (and possibly some of yours) we can go more in-depth about part of the practices of your culture. As a general rule, in every country that ever existed, holidays mean something. Whether people remember their meanings clearly depends on the people and the length of time since the holiday was first celebrated; but if you dig beneath the layers, you will find a meaning to almost every holiday that exists in our world. Holidays help people to remember. Usually events, but occasionally people. Purim celebrates the rescue of the people of Israel from brutal slaughter at the hands of a man named Haman. Over the years, it has also begun to be used to remember other times of suffering or oppression for the Jews. Every time Purim comes around, they remember suffering and, ultimately, rescue. Of course, some people who celebrate this holiday don’t honestly care; it’s merely yet another holiday for them. And there will always be people who don’t care about what the holidays mean anymore, wherever you go. Holidays almost always have to do with beliefs or history. Christmas, anyone? (We’ll talk about that later.) Easter? Holidays form out of exuberant people wanting to celebrate, or out of frightened people trying to prevent something. Most of the Jewish holidays (Purim included) are born from a desire to celebrate. The so-called holiday of Halloween came from a pagan belief that they needed to scare away evil spirits by dressing up as demons and devils (no doubt here as to my opinion on Halloween). They were frightened people who went to drastic measures. Holidays come up with bizarre traditions. Have you ever noticed how strange it is to haul a tree into a house and hang things on it? Or to tack your socks up onto the fireplace? Usually, the traditions had a beginning at some point; people rarely remember what it is. So while you may want to find out why they have their traditions, it probably shan’t be important to mention in your novel. They forget the original point of the holiday. They assign different meanings to it. Christmas was originally a pagan feast day, which Christian missionaries decided they could keep if they called it Christ’s birthday. People have forgotten what certain holidays mean, and people will forget in every culture—sometimes the meaning they assign anew to a holiday is better than the original; sometimes, it is worse. 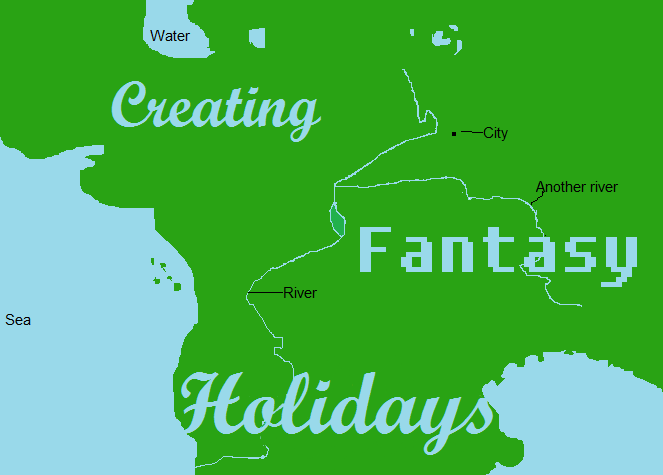 Holidays show a lot about your fantasy cultures. It shows what they’re willing to celebrate, what they’re willing to call tradition, and what they call holy. Does your fantasy culture have any holidays or celebrations?